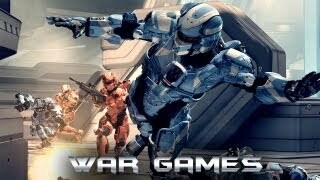 Developer:343 Studios Genre:ActionShooterSci-Fi Release Date: November 06, 2012 Download Games Free Now! Bungie’s Halo franchise has grown truly massive, selling over 46 million games and generating over three billion dollars in revenue. That’s huge for a game originally conceived as a Mac title way back in 1999 when there were barely any games available for Apple computers, let alone good ones. Halo 4 is the first game in a new trilogy of Halo titles developed by 343 Industries instead of Bungie. Understandably, this studio switch made many Halo fanboys a little nervous about the new and possibly unwelcome changes to the game’s formula, but rest easy, my friends: Halo 4 is boss like Master Chief. 343 Industries have crafted an excellent story for this next chapter in Master Chief’s life. Cortana, the blue-skinned hologram AI who guides our Spartan hero through all his missions, is succumbing to “rampancy,” a degenerative disorder that strikes any AI that has been in service for more than seven years. Unable to process the massive amounts of data she has accumulated over her short lifespan, eight year old Cortana is being slowly driven insane by the constant influx of information washing over her and interfering with her increasingly human personality. It’s a touching take on the classic trope of a man-made creation becoming too human for its own good, but this is only one facet of the storyline. Obviously Master Chief has to save the world again from a deadly alien race: this time his foes are the Forerunners, an ancient and terrible race (yadda yadda) who look kind of like Metroid’s space pirates had babies with Skeletor. The game perfectly balances action with emotion, resulting in one of the most engaging narratives in the series. If you play Halo for story, you won’t be disappointed. The gameplay is as great as ever, even if it isn’t a hugely deviation from the series standard. If it ain’t broke, don’t fix it, right? The game’s new enemies have some of the best AI Halo has seen, forcing you to strategize at every encounter, especially on the Heroic and Legendary settings. You’ll face some familiar enemies, but the most exciting firefights are against the deviously intelligent Forerunners. One of the most challenging enemy types is the Forerunner Watcher, not because it in itself is hard to take down, but because of the assistance it gives to your enemies. Watchers will pick up grenades you’ve tossed into a pack of Prometheans—the Forerunners’ powerful footsoldiers—and throw them back in your face. They’ll resurrect dead troops and even provide them with shields. Needless to say, you’ll want to take the Watchers out first, but I promise you that this is often easier said than done. I didn’t get to spend a lot of time with the Heroic and Legendary difficulty settings, but what I did play of them was extremely challenging. Each difficulty setting has a unique ending, offering incentives to play through the game multiple times. You’ll definitely end up going back for more, even if you die all the time. Now, the section you’ve been reading for: multiplayer! You probably already know things haven’t changed too much in this department, because 343 Industries obviously wants to avoid death threats from rabid Halo fanboys who think they own the series, but there are some interesting developments that’ll either piss you off or make you think “Finally!” The multiplayer mode is named—somewhat pretentiously—“Infinite,” and ties into the Halo universe’s narrative by making you play as Spartan-IV soldiers in virtual training environments. Each soldier is equipped with unique specializations including a primary and secondary weapon, armor abilities like camouflage or a jetpack, and type of grenade. These customizable character traits are surprisingly well balanced, continuing the series’ multiplayer winning streak. Halo 4 takes a cue from Call of Duty by adding Ordinance Drops to multiplayer, which basically function like killstreak rewards. Some people like to complain about killstreak mechanics because they discourage team play in objective-based multiplayer modes, but the good news is that you can edit these settings however you like, and even turn off Ordinance Drops completely if you’re a purist. There’s also a brand new experience system with unlockable rewards as you level up, including new armor perks, weapons, and so on. It’s a great incentive to play multiplayer a lot, but it also might result in newbie players getting crushed. Finally, 343 Industries have committed to releasing 10 cooperative missions sets as monthly DLC for Xbox Gold subscribers. These missions are a good way to rack up experience and achievements, but so far, the missions have paled in comparison to the excitement offered by the single-player campaign. It’s pretty much guaranteed that they’ll get better over the coming months. Halo 4’s graphics are the best the series has seen. 343 Industries have put their own stamp on the characters: Master Chief and Cortana look different but familiar, and characters are rendered exquisitely in the game’s frequent cutscenes, looking more human than most computer generated people I’ve seen in video games. The sound design is great too, from Master Chief’s clanking boots to the angry cries of your enemies. Play this game with surround sound for the full experience: it’s worth it. It’s a bit jarring to hear a brand new musical style for this next trilogy in Halo’s canon; Gregorian chanting and Celtic –influenced instrumentals are replaced by the electronic stylings of Massive Attack’s Neil Davidge. Halo purists could be a little disappointed by the change, but I really liked the soundtrack, and felt it underlined the fact that Halo is entering a new era with 343 Industries. As expected, Halo 4 is a brilliant game. While it may not be a totally new experience for fans of the series, 343 Industries have subtly rebranded the game without departing from a classic formula too harshly. I’m already looking forward to Halo 5 and wondering how the game could possibly look or feel any better than it already does, but I’m sure its release on the Xbox 720 will blow my socks off yet again. Halo 4 truly deserves its excellent Z-Score of 94: go out and get this game, now!